Deb's Cup of Tea: Wait...What? Unless your means of transportation runs on oats and hay, you know gas prices have been plummeting. It's not really akin to dropping a stone from two stories up. It's more like a meander down the twistiest street in the US. I've watched prices slide here in Chicagoland. Sometimes, they have dropped as much as a nickle in one day. You do know what a nickle is, right? They will recover a few pennies and slide further. Needless to say, the monetary cost budgeted for gas was slightly off. 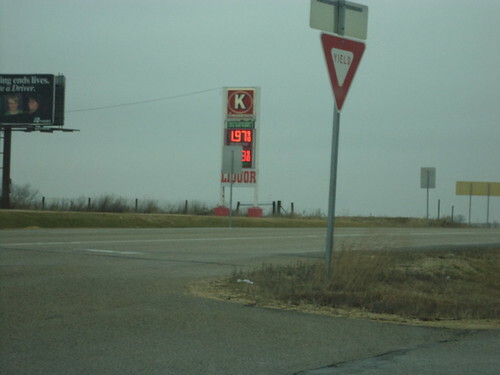 Before we left the state on our way back to Wheaton on Thursday, we were able to top off the tank with $1.99 gas. Since then, gas is rumored to be below $2 in the Chicagoland area. I'll believe it when the stations along the route to work are below $2. Right now, it's been $2.27 for awhile. We were talking about that today at work. It's been several years since we saw these kinds of prices. For us, who spend a lot of time in our cars, driving to various job sites, this is very good news. More money in my pocket, means I'm closer to a goal of paying off one more credit card this year. I do think being more frugal with gas consumption helps keep the prices low. Even with these low prices, I'm not inclined to drive any more than I currently am. It does mean that when I travel, I have more pocket change to spend at businesses along and at my final destination. Who knows, if this lower price for fuel translates into lower airfares, I might be able to fly somewhere. Now that's crazy talk.